If you’ve ever wondered how to toast nuts in the microwave perfectly every time, you are not alone! It’s so easy and only takes a few minutes! Prepare for your life to be forever changed. Toasting nuts, any kind of nuts, well, it stresses me out. 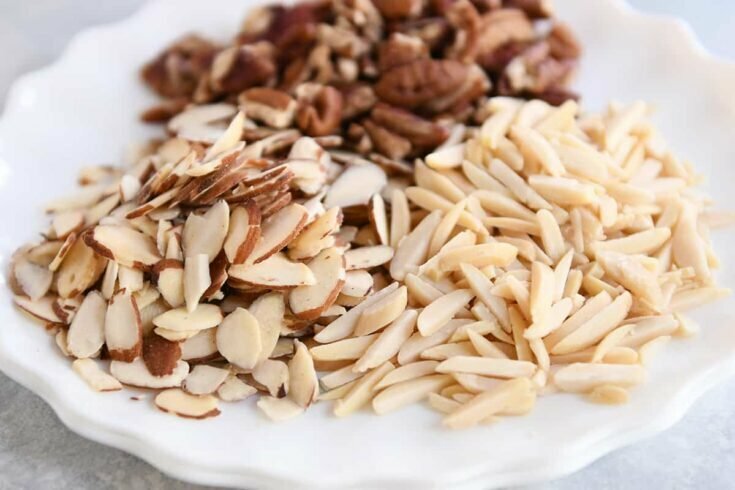 Not because it’s that hard, but I cannot tell you how many times I’ve tossed almonds or pine nuts in a warm skillet or in a preheated oven only to walk away and somehow COMPLETELY FORGET that I’m trying to toast nuts. 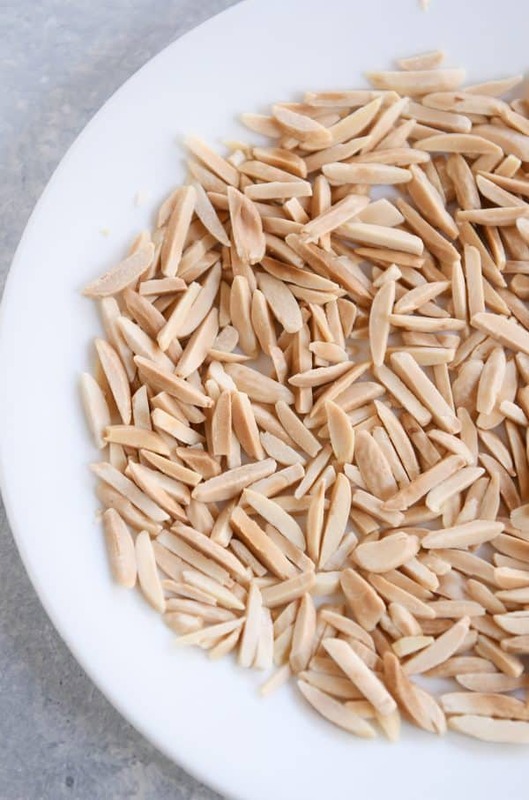 Hello, burned almonds. You and I are friends. Consider my life forever changed when a reader, Ashley, told me that toasting nuts in the microwave was not only doable but pretty much foolproof. Did you know this could be done? Am I, like always, the last to know about this? Because honestly, I don’t think I will ever put pecans in a skillet or oven again to roast and toast their life away. Microwave toasted nuts forever. And here’s the kicker, it’s literally as simple as spreading about 1/2 cup nuts in an even layer on a microwave-safe plate or dish and microwaving in 1-minute intervals until lightly golden and toasted. In a side by side test of unsuspecting kids, they couldn’t tell the difference between nuts toasted in a skillet compare with nuts toasted in the microwave. No weird tastes. No strange textures. Just plain old delicious toasted nuts. If you’ve been wondering how to toast nuts in the microwave OR if you’ve never even had the thought but are now super curious, I think you should drop what you’re doing and go try it. Seriously, just grab some nuts – any kind! – out of the pantry and give it a whirl. If, after toasted nut success, you squeal in a high pitched manner and spin around in excitement knocking the trash can over…you and I can be BFFs forever. -that plate/dish is going to get hot so make sure you use oven mitts or pot holders to take it in and out of the microwave! 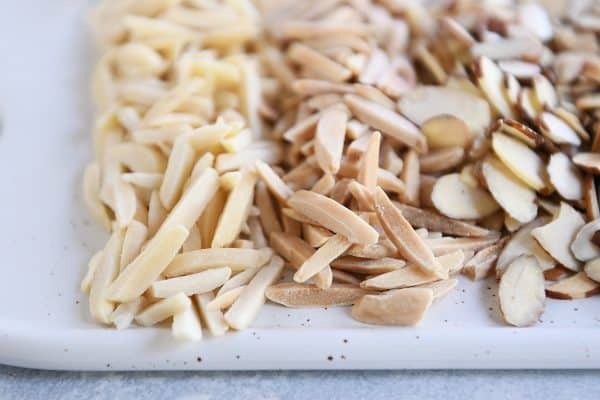 I have a Kenmore microwave (1550/1000W) – no bells, no whistles – and it takes about 6-7 1-minute intervals to get slivered almonds roasty toasty and perfect. 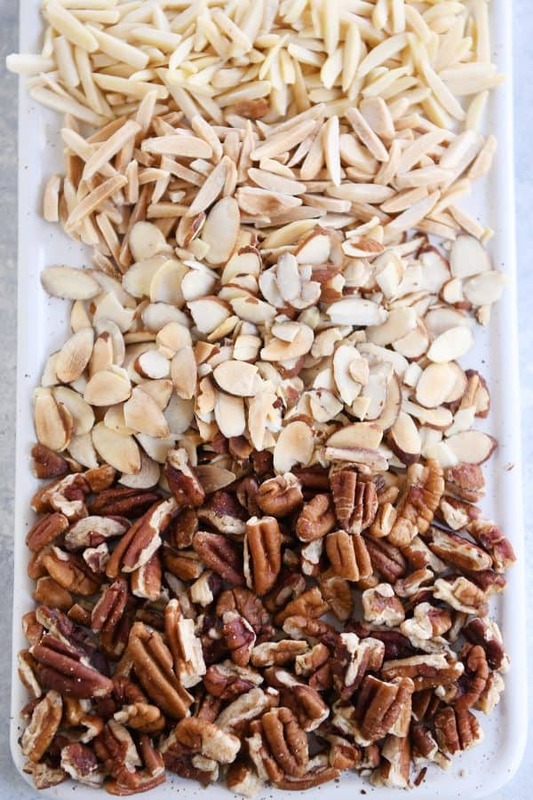 About the same for pecan pieces but slightly less time for sliced almonds. If you want to live life on the edge, you can try doing a 2-minute spin in the microwave to get things started and then back off to 1-minute intervals, tossing in between. But I’m only recommending that for people who won’t get mad at me if they end up with over-toasted nuts (that sounds better than “nuts that have been burned to smithereens and a house that will now smell like burned nuts for 2 1/2 weeks”). 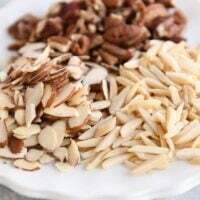 I can honestly say that as a recovering nut burner (hmmm, that sounds alarming on so many levels), I have not burned a single almond, pecan, pine nut, or walnut since learning of this method. I know I tend to throw around “life changing” with the wind, but I can assure you that learning how to toast nuts in the microwave cements itself as life changing tip of the year. Also, rumor has it that you can toast coconut THE SAME WAY. Excuse me while I go weep in the name of progress. Place the nuts in an even layer on a microwave-safe plate or dish (a glass pie plate works well). Microwave for 1-minute intervals, removing the plate and tossing in between (plate will be hot so take care! ), until the nuts are sizzling, golden, and toasted. The exact time will depend on microwave power/watts as well as the type/size of the nuts. 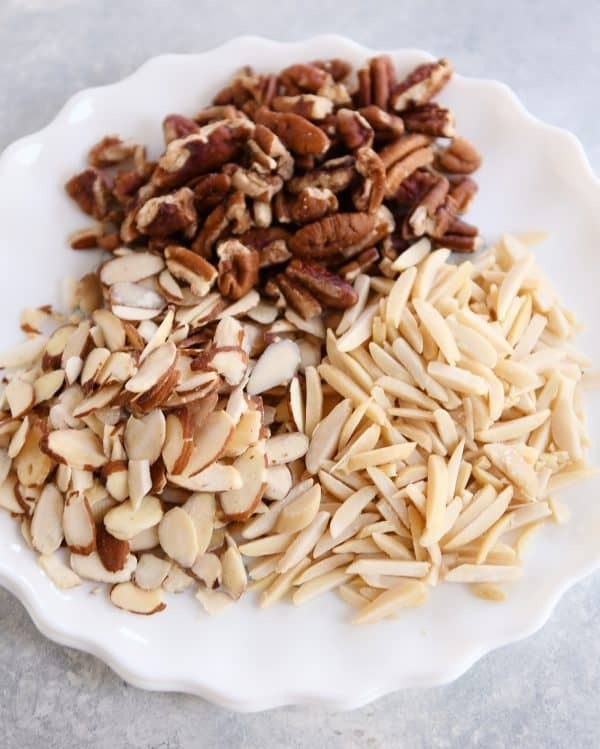 In my microwave, it takes about 6-7 1-minute intervals to toast slivered almonds and pecan pieces and slightly less time for sliced almonds. Watch the time carefully as each microwave may vary! Rumor has it you can toast coconut this same way. Recipe Source: idea sent to me by a reader, Ashley! This worked beautifully for getting the skin off of hazelnuts, a task I have always dreaded. Thanks so much! I tried it with sugar and couldn’t get it to work. The sugar never melted. I had to end up putting them in a pan to get them sugared and they got very toasted. This was very helpful. Years ago, I had a walnut salad dressing recipe that called for toasted walnuts, and I blew it. Resurrected, and this time I could make it. It’s a delicious dressing, BTW. Thanks! I went to a pampered chef party this weekend and the lady doing the show had done coconut this way! My mind was blown! Then a short bit after I left said party I got on here and saw this post! Haha! Mind double blown!! Thanks for your awesome tips! You are most definitely not the last person to know this bit of information!! I tend to wander off when toasting nuts in a skillet or oven myself, so this is AWESOME information!! Thank you so very much!!! Fascinating! Well, I guess I’m the last one to find this out! Can I just say— I was once melting butter in the microwave, left it in a bit too long and I ended up with browned butter! It was surprising good with artichokes, and obviously in your baked goods and frostings, too! I have never tried it again- so much popping and microwave mess, but it could be perfected I’m sure! Have you tried the sugar coated nuts in the microwave? I haven’t – but I think I will soon…I’ll report back! 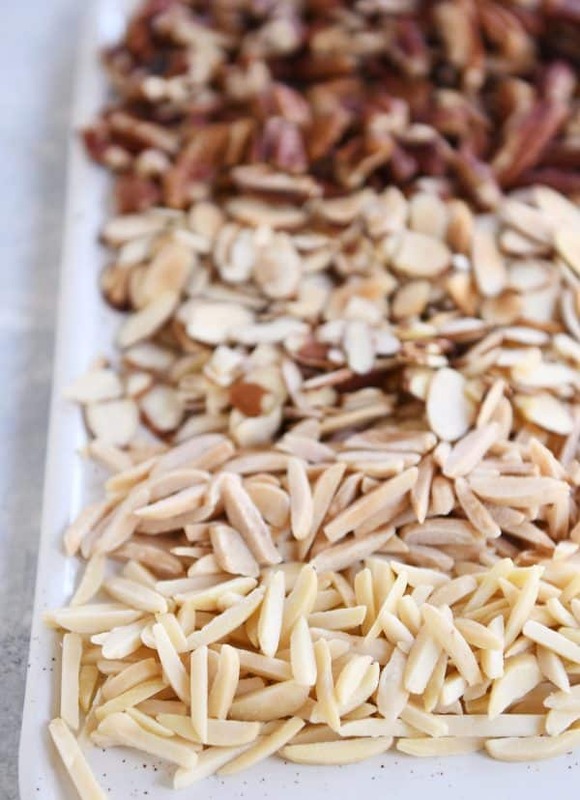 Dumb question alert: so this method works to toast nuts, but does it also roast nuts? I have a recipe that calls for roasted pecans, can I just microwave them instead of using the oven? I think technically “roasting” the nuts is something different, but if it were me, I’d use this method. Cooking the nuts basically releases the oils and adds a depth of flavor to the nuts. “…recovering nut burner”…you had me spewing coffee outta my nose!!! LHOL!!! But, oh the joy of finding out that I can roast nuts…and maybe coconut, too, in the microwave… I am right there with ya on that “life changing” feeling!!! That you forever for that!!! Now to go change shirts! **THANK you, not “that” you”….you just have me all shook up!! I always thought I was the only one! I secretly hid my shame, thinking I was the only person out there with an attention span so short that I would repeatedly burn pan after pan of nuts. So first of all, thank you Mel and all other commenters for making me feel like I am not an alien. And second of all, this is life changing. WOW. Thank you! Well, I had never heard of using the microwave either, if it makes you feel better. I laughed at your mention of completely forgetting while toasting nuts. I have done that so many times that now I set a timer AND make my teenage daughter stand at the stove as sentinel because I will still wander off and forget. I will have to try this! I was just reading your latest blog about roasting nuts in the microwave and I’m excited to try it. 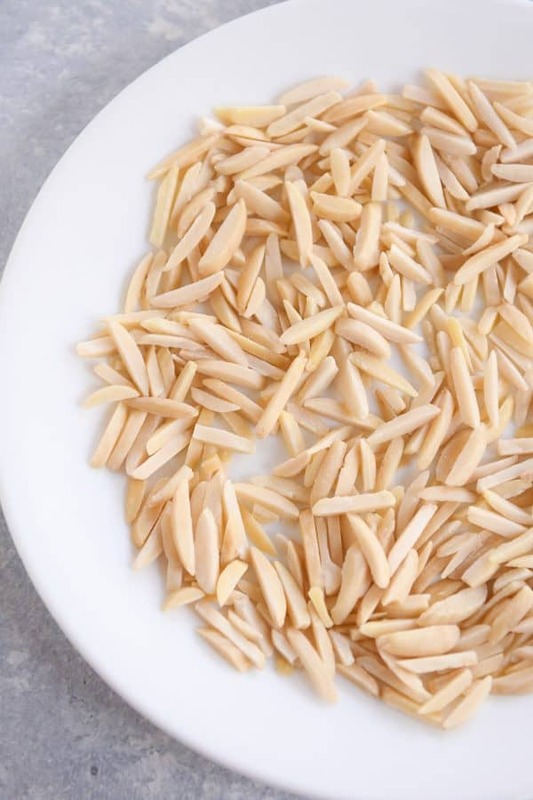 However, as my children just carved pumpkins and they saved all the seeds, what do you think about roasting the seeds in the microwave using your technique? I definitely think it’s worth a try! I have also burned nuts in the microwave. Weep. I had my first experience using the fire extinguisher in a real life fire a couple of weeks ago when I forgot about my coconut toasting in my toaster oven while attempting to make your coconut rice krispy treats. Let’s just say my house was smoky, I was traumatized, and my rice krispy treats were just normal plain ones. I’m so glad I never ever have to attempt that again and that I can just use the microwave! Yay! You are amazing!!! I need to toast nuts and coconut and I wanted to do it this morning but ran out of time. I so needed this! Thank you! Thank you! What an wonderful email to get today! This is genius. I, too, am a nut burner. Love! I appreciate this so much! I always buy extra nuts knowing that I will probably scorch the first batch! Thank you! This is the best recipe I’ve seen in a long time! No more nut burning for me! Thanks so much! Are you serous…how many pans of nuts have I charred..because I’m just going to run to the bathroom…and then I wander to the ever needy laundry room..throw in a batch…as I’m walking back up the steps…I smell those dang nuts burning again! And nuts aren’t cheap! I can’t wait to get home and give this a try! I’m so with you! Nut burners unite! I have named every excuse possible to explain away my inability to remember to stay by those nuts. Expensive, smelly mistakes year after year! I just learned the possibility of the microwave trick two weeks ago, so I am so excited to join your nut parade. Thanks for the tutorial, Mel! Serious?? Mind. Blown. You know I’m off to experiment! No, Mel, I think this post makes me the last person to toast nuts in the microwave!!! How many countless pans of burnt nuts I have thrown away…makes me cry. You are not alone…I have burned nuts so many times because I got distracted.So frustrating! Thanks for the awesome tip! i am a chef. i can cook anything, but i can’t remember to take the nuts off the burner. i am doing the yippee skippee *ALL over the place!